Anibal Ollero head of the GRVC has been elevated to IEEE Fellow for contributions to the development and deployment of aerial robots, a satisfying new with which the GRVC group has closed its successful year 2018. 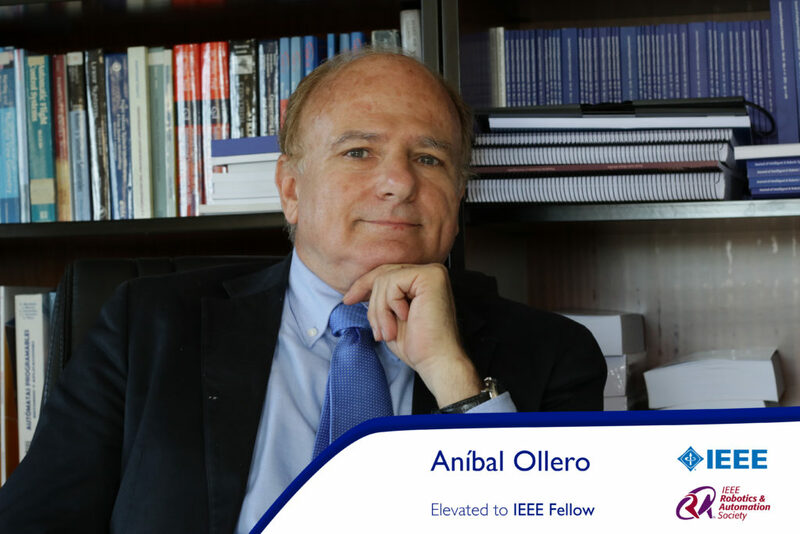 According to the IEEE web, the IEEE Fellow is “a distinction reserved for select IEEE members whose extraordinary accomplishments in any of the IEEE fields of interest are deemed fitting of this prestigious grade elevation”. This grade appeared for first time in 1912, and was stablished for the engineer members whom achieved distinction in their professions. IEEE is a professional society focused on the advancing innovation and technological excellence for the human benefits and it is designed to serve professionals involved in all areas of the electrical, electronic and computing fields.